ECG with Sick Sinus Syndrome. Rapid atrial fibrillation abruptly stops. 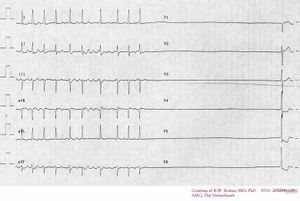 Brady-tachycardia syndrome; typically there is sinusbradycardia, sinusarrest or SA-block which is alternated by periods with fast or (ir)regular atrial arrhythmias (atrial fibrillation, atrial flutter, atrial tachyardia or sinustachycardia). Usually a pacemaker is implanted to prevent bradycardia and tachycardias are 'topped off' with anti-arrhythmics, such as beta blockers. This page was last edited on 25 April 2010, at 10:51.